Mestizaje, a Latin American heritage focusing on the mutual intersection and transformation of the European and indigenous peoples in the Americas has had two predominant interpretative paradigms. South of the U.S.-Mexico border, both ruling elites and scholars have frequently used mestizaje to justify a mixing of European, indigenous, African, and other peoples that nevertheless have the European culture ascendant. Conversely, in the U.S. Latino heritage north of the U.S.-Mexico border, the conquest of the U.S. Southwest by predominantly European-American settlers has led many U.S. Latino scholars to render mestizaje as resistance and as a way of seeking agency against this hegemony. Given that that these competing mestizaje paradigms respectively objectify the oppressed and in turn the oppressor, this article suggests that this conceptual impasse is a subset of the ongoing debate in philosophy and political theory between universal schemes that have little use for particular perspectives, and separatist schemes that are leery of universal narratives. 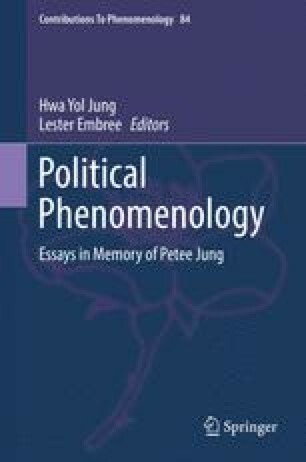 Building upon Merleau-Ponty’s notion of a lateral universal, the article reviews how the transversal approach articulating by Fred Dallmayr, Hwa Yol Jung, and Calvin Schrag elicits a unity-in-diversity that seeks understandings that are neither universally transparent nor particularly relativist. The article then concludes by reviewing how the transversal mestizaje in works of Jacques Audinet, Virgil Elizondo, and Jorge Gracia elicits the possibility of lateral, egalitarian intersections between diverse peoples and cultures.